NEW ORLEANS, LA — Robert Morris began his career in print journalism, working for a string of weekly and daily newspapers before deciding he needed a change. “I liked journalism and I liked my job and I really liked the people I worked with, but it seemed like such a long road to be a 28-year-old reporter watching the newspaper industry shrink,” he says. Coupled with his concerns about the newspaper industry were thoughts about whether founding and running a small, independent organization might give him a closer relationship to his audience. Originally from Hattiesburg, MS and having formerly worked at the Houma Courier, a South Louisiana newspaper, Morris decided New Orleans would be the ideal place to forge a new relationship with a community, and, through this, create a new place for himself in the profession. In August 2010, he moved to the city’s Uptown neighborhood and founded his community news site, the Uptown Messenger. Morris initially funded his new venture with freelance assignments while working to build the Uptown Messenger’s reputation among both the community and advertisers. The site gained legitimacy in stages, starting with Morris’s work to cover the community’s ongoing efforts to rebuild after Hurricane Katrina. “It was extremely grassroots,” he says, noting that his readership at the time didn’t extend much beyond people directly involved with or interested in the stories he was covering. Many of the early stories derived from community neighborhood meetings, serving as a messenger and voice for the small-scale organizations. From there, Morris began to cover neighborhood crime. It wasn’t until 2011, however, when his crime reporting began to gain significant readership. An outbreak of robberies, culminated in the shooting death of a local chef in May 2011, sparked interest in what by that time had become a rich archive of crime stories on the site. A third influx of attention came in the summer of 2012, when New Orleans’s then-daily newspaper, the Times-Picayune, reduced its print production to three days a week and laid off nearly half its newsroom. It was at that point, Morris says, that residents began looking to alternate news outlets in earnest. 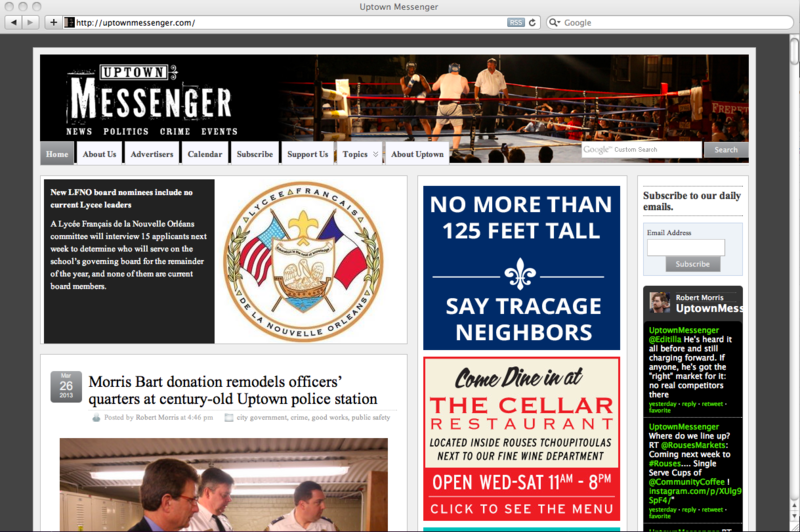 Uptown Messenger earns revenue from local display advertising, some donations, and an exclusive content sharing partnership with WWL-TV, a local news television channel. With site maintenance costs relatively low, Morris says that he is able to pay himself a living wage for his efforts running the Messenger, which is incorporated as a for-profit. In January 2013, Morris launched Mid-City Messenger, a community news service modeled on Uptown Messenger that focuses on another New Orleans neighborhood. Morris oversees the site, which is run by reporter Marta Jewson, who also freelances for NOLA investigative startup The Lens. In facing this challenge, Morris takes confidence from his efforts on the original Messenger site. Not long after the Times-Picayune layoffs, Hurricane Isaac hit. Morris reported in real-time on everything he could think of that would help residents ride out the storm, from what stores were open, to restaurant menus, to which communities had lost or regained power.